This fantastic 16 day China and Japan holiday offers every opportunity to compare both countries as you experience a wide range of natural highlights and cultural contrasts all the way from China’s Great Wall to Japan’s Mount Fuji. Travelling by plane, train and ferry this China and Japan holiday allows you to watch landscapes unfold from one iconic city to the next with Beijing, Xi’an and Shanghai in China combining with Osaka, Kyoto and Tokyo in Japan to absolutely wonderful effect. 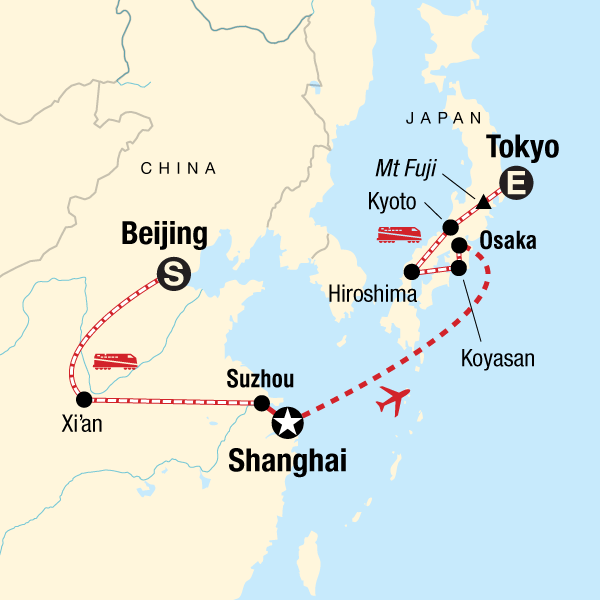 Although this China and Japan tour incorporates many of the region’s well-known points of interest you’ll also discover numerous experiences and activities off the beaten path with chances to stay overnight in authentic ryokan and shukubo temple accommodation in Japan just one of several memorable moments. From the ancient legends of the Terracotta Warriors to the not so distant memorials in Hiroshima, this China and Japan combined tour gives you the very best of both worlds with cultural insight and exciting adventures lying in wait around every historic street corner. Book a Hutong Tour by rickshaw in Beijing and discover the city’s fascinating old world. Small group. 4-18 adults (min age. 18), tour leader. Some meals provided; local recommendations available. Accomm., transport, some entry fees, tour leader. This company has operated on responsible tourism values since its inception. From an environmental perspective, our initiatives extend from our company offices to our tours. A local green energy provider powers our head office and stores, we encourage cleaner transportation methods for staff, and purchase all supplies from a local green business supplier. Our office is as paperless as possible and our brochures use 100% PEFC certified sustainable paper. We offset emissions from all corporate flights and our marine vessel, and encourage our travelers to do so by providing an online platform through Sustainable Travel International. Low Impact Transportation: This trip gives you the chance to try out overnight sleeper trains, the famous rickshaws and Japan’s bullet trains. Getting around as the locals do not only allows you to experience the culture on a deeper level, but the same way it is at home, using public transport is the most sustainable way to go – after walking and cycling of course! Support World Heritage: On this trip there are numerous opportunities to visit important heritage sites on foot or by bicycle. In China we visit the famous Tiananmen Square, the Forbidden City, Temple of Heaven, and of course the Great Wall and the Terracotta Warriors in Xi’an, among other fascinating sites. In Japan we visit Hiroshima Peace Park. This memorial park is dedicated to people who lost their lives or suffered the first nuclear bomb attack. There is the haunting UNESCO heritage sight A-Bomb Dome which is the ruins of the old Industrial Promotion Hall that still stands. We also visit Himeji Castle. Himeji-jo is the finest surviving example of early 17th-century Japanese castle architecture, comprising 83 buildings with highly developed systems of defense and ingenious protection devices dating from the beginning of the Shogun period. Not to be forgotten is Kyoto. Kyoto has some of the most magnificent temples in Japan, which date back centuries. There are said to be 2,000 temples, shrines, palaces, museums and traditional gardens in Kyoto. Celebrating world heritage is an important way to participate in sustainable tourism. Many world heritage sites are designated for protection so that all the world’s people can share in these fascinating and historical wonders for generations to come. Supporting local culture and businesses: There are a multitude of opportunities to support local businesses and immerse yourself in Chinese & Japanese culture on this trip. China’s multi-ethnicity is evident in the Muslim Quarter. In Xi’an you can visit one of the oldest and best-preserved mosques in China. This is probably one of the few mosques in the world that incorporates a mixed architecture of traditional Muslim and Chinese styles. Our style of trip, travelling, eating and staying with the locals, puts you right at the heart Chinese & Japanese culture. It may not be apparent that learning about and respecting other cultures is part of being a responsible traveler, but we believe that this discovery is a natural way for people of all backgrounds, nationalities, and religions to interact and learn from each other, fostering peace and understanding. And it’s just plain fascinating! Explore your spiritual side: This trip takes us to Mt Koya, a religious centre founded in 816 by the Buddhist monk Kobo Daishi. The train ride up the mountain is possibly one of the finest rail journeys in Japan. For the final steep ascent, we switch to a cable car. On the mountain we stay in shukubo (temple lodgings run by monks), eat shojin-ryori (vegetarian meals) and can have the chance to take part in morning prayers, and discover what a monk’s life is really like! The life of a Buddhist monk is very calm and simple, possibly one of the lightest lifestyles in terms of impact on the planet. It is a moving experience and journey in self-discovery to try living in this way even for only a short time. Of course there are many fascinating temples to see, and the chance to talk with the monks. Other optional unique experiences on this trip that allow you to support the local economy and learn about Chinese culture include - Hutong Tour in Rickshaw (Beijing): Take a rickshaw tour through the hutongs and discover the old world of Beijing, stopping by for lunch at a local family's home. Truly an authentic experience! Tai Chi in the Park: Rise early and join the local for a lesson on Tai Chi in the nearby park.